The Eloquent Woman: Conference co-chair asks "Would I attend my own conference?" 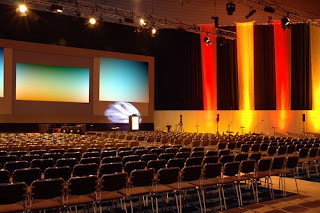 Conference co-chair asks "Would I attend my own conference?" Here's the difference: Milstein isn't just any attendee, she organizes major conferences and has spent a lot of time focused on the problems around getting more women on the program at professional conferences, something we've discussed frequently on The Eloquent Woman. You'll learn a lot from this post, which not only does a great job summarizing the many debates on this topic in the tech world, but Milstein's process of looking for great women speakers, from keeping lists to watching videos. What do you think of this post and its suggestions? What are your suggestions for addressing the issue--which is a problem even in professions dominated by women? Share your ideas in the comments.